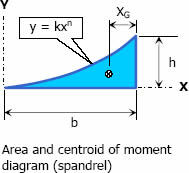 The moment-area method of finding the deflection of a beam will demand the accurate computation of the area of a moment diagram, as well as the moment of such area about any axis. To pave its way, this section will deal on how to draw moment diagram by parts and to calculate the moment of such diagrams about a specified axis. The bending moment caused by all forces to the left or to the right of any section is equal to the respective algebraic sum of the bending moments at that section caused by each load acting separately. where n is the degree of power of x.
and the area and location of centroid are defined as follows.